Last week, Foodette Reviews was invited, along with a host of other awesome bloggers, to travel to Dublin, Ohio, and tour the Wendy’s corporate headquarters to celebrate the launch of their newest product, the Grilled Chicken Flatbread sandwiches. (We were actually a test market for these and reviewed them HERE, but will revisit them to tell you how they’ve changed since their testing.) 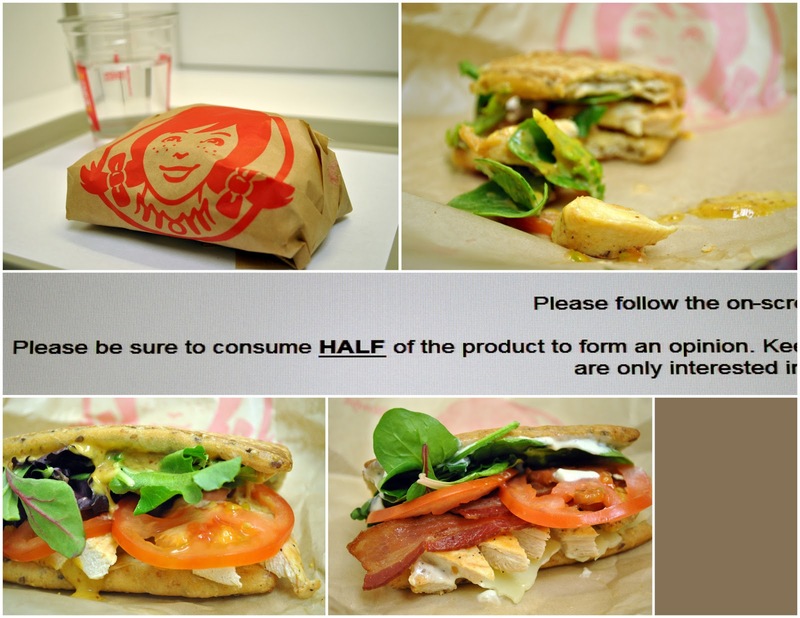 The trip was a wonderful look at the Wendy’s brand, its innovations and challenges as it strives to set itself apart in the fast food market, and of course, the food. We arrived on Tuesday and got settled in, and kicked off the event with a dinner and cocktail reception with members of the Wendy’s corporate and PR team. On Wednesday, we woke up bright and early to catch a shuttle to the headquarters for our tour. We started with breakfast and, of course, coffee from the Redhead Roasters themselves, and listened to an introductory talk by Vice President of corporate affairs. From there, we started our tour with the head of R&D. 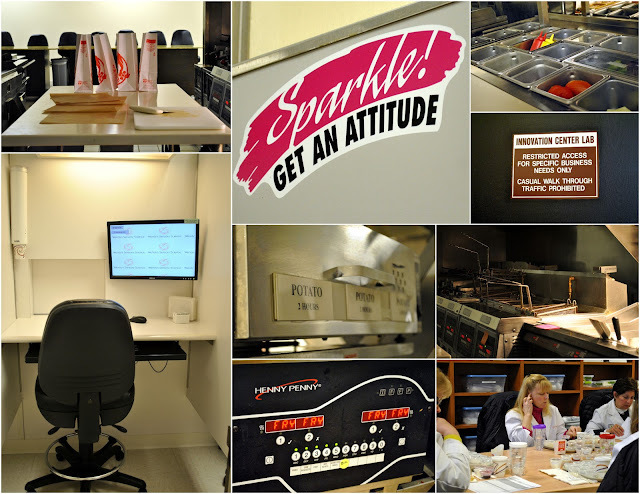 Our tour started with a peek inside the research and development tester room. These testers are different from consumer testers—they spend four hours a day on iterations of one product, comparing it with these jars here to get a base of the levels of sour, sweet, salty, flavors and types of texture, too. A rigorous job as they are not allowed to specify any sort of preference and must remain objective in their analysis of whatever they are tasting! They looked like they were having a good time, though. From there, we toured the test kitchen and model restaurant kitchen – the difference being that the latter replicates the scale and equipment found in a Wendy’s restaurant, the former for development and product tweaking before trying it out in the model restaurant kitchen. And yes, all phasers were set to “fry”. This is the window through which the consumer test samples are served. It was here that we were given our first taste of the day, along with a pop quiz—but it was the sandwich, not us, being graded. 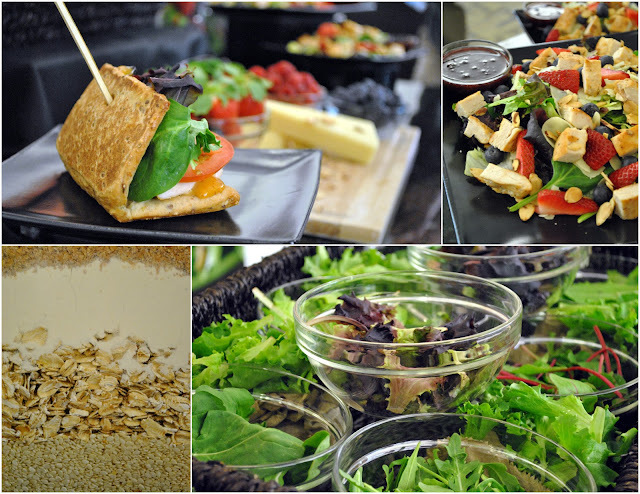 We answered around 34 questions per sandwich, ranging from the preferred amount of one type of ingredient to the crunch and texture of another to the “level of messiness.” Ultimately, our group was fair, but strict- we gave the new sandwiches an average of a “B”. Remember these? It’s the flatbreads, made with five types of grains and some damned good chicken. The first, Smokey Honey Mustard, features a whole-grain honey mustard sauce on grilled chicken with greens and tomato, and the second, Asiago Club, has grilled chicken, shavings of asiago cheese, bacon, and a ranch sauce with greens and tomato. The ingredients haven’t changed, with the exception of the honey mustard. With this version, there were many more whole mustard grains and a far more pronounced smokiness, which I vastly appreciated. The packaging may also be tinkered with, though I’m not sure what will be nationally rolled out. Again, both are delicious and I love the flatbread base, it’s still chewy and slightly sweet and I imagine it will be a fantastic addition to the menu with plenty of flavor variations to be found. From there, we went back to the main conference room where we tried a few more tasty treats. Wendy’s is bringing back the Almond Berry Salad, my personal favorite salad of…all the salads, actually. Seriously, see my write-up: it’s the only salad I’ve eaten in its entirety. Because I’m six years old and hate vegetables. But really, it’s excellent and I’m so glad I’ll be able to pick one up again. While we munched, Wendy’s registered dieticians spoke to us about the ways they try to incorporate healthy, seasonal ingredients into their food without compromising flavor. The salad is certainly testimony to that philosophy, that’s for sure. Of course, we had to get a reminder of Wendy’s famous product – cheeseburgers! (Not pictured, I was stuffed and sleepy.) At this point, only one bite of the Double Stack was possible, but the iconic flavors and fresh ingredients definitely stuck out. The Double Stack, chili cheese fries, and a large drink are available for a mere $5 after 10PM as part of the Moonlite Meal Deal, which started yesterday. After all that food, we realized we hadn’t yet had dessert. Oy! So we hopped back in the shuttle and went to one of Wendy’s first image-activation restaurants, which will hopefully be popping up all over the country. 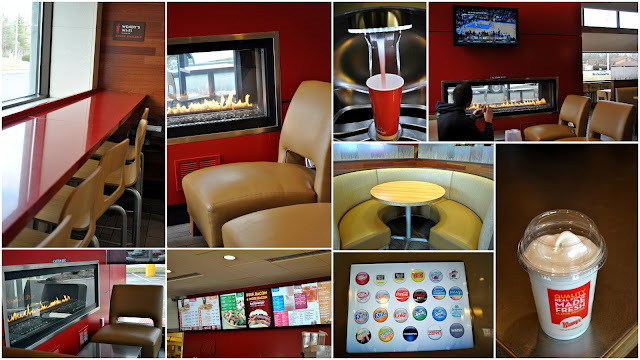 These are very cool, and feature fireplaces, stainless steel accents, awesome customized Coke Freestyle machines, and WiFi throughout the restaurants. They look awesome. And that was our visit! It was a whirlwind, and the Wendy’s team made sure we had a wonderful time and saw as much as we could. It gave us a great idea of the philosophy behind the corporation, filling in the blanks other restaurants leave behind when it comes to consumer relations, and it was great to hear the story behind my new favorite sandwich. Thanks again, Wendy’s!